Two disappointed readers who missed out on last week's blow-out dye transfer sale asked me if I'd be making digital prints of "Roses Against Black Stone Wall" and "Niagara Falls" in the future. I won't be able to say for certain until I try, but the prospects are very good for the latter and problematical for the former. Why is that? It goes to the inherent strengths of the two media. Something that dye transfer has uniquely going for it is the huge density range it can render. It's possible to achieve a D-max of 3.0 if the subject demands it. Furthermore, the medium is more linear in the shadows than conventional darkroom materials. That means that dye transfer prints can hold more and deeper shadow detail and produce better tonal separation in the shadow detail that falls within the range of other print media. For many photographs, even most, this is not a critical issue; the quality of the shadow detail doesn't make or break the photograph. Sometimes, it does. Within a few years of taking up dye transfer printing, I was photographing with that in mind. I knew I could print an exceptionally long exposure range and rich but open shadows, so I didn't hesitate to photograph subjects that would demand that. For example, I started photographing in the American desert under the midday sun, a time avoided by most color photographers, because I could hold both highlight and shadow detail in my prints. I definitely made the photographs in my Jewels of Kilauea series with dye transfer in mind. All that rich, black shiny pahoehoe just soaks up the light and provides a great backdrop to the iridescent flashes of color that I'm photographing. The problem is, many of the compositions fall apart without that impression of intense shadow detail you could fall into. Figure 1, for example. I've tried printing that as a digital print. So far it's been a failure. The photograph doesn't work well without those three dimensional shadows. A lot of the photographs in the series are like that. Probably has something to do with why those prints haven't sold very well; I can't reproduce that quality in a JPEG any more than I can in a digital print. Consequently, the online presentation doesn't show those photographs in a good light. All of this is subject to change, of course. There's no fundamental reason future digital printing technologies and displays can't give me as rich and long-range a rendering as dye transfer does. But at the present time they come up lacking. I'd say that approximately 20% of the photographs in my portfolio just won't work as digital prints, for the present. "Roses" may turn out to be one of them. I won't know if it depends upon that shadow detail richness and three-dimensionality until I try printing it without that. I may be able to come up with an interpretation in a digital print that entirely satisfies me. If not, I'll be disappointed but not surprised. At the highlight end of the tonal scale, though, digital printing is massively superior to anything I can do in the darkroom. In this case, though, it's not about any inherently superior tone or color rendition in the digital print media—it's all about the control. Highlights are very difficult to precisely control in the darkroom, regardless of the process. It's inherent in the nature of silver halide print materials; there is always a severe rolloff in contrast in the extreme highlights. Consequently, it's very hard to separate delicate highlight detail from the paper-base white. In addition, the usual darkroom controls and masking methods, even with a process like dye transfer, give you fairly poor and crude control over the exact shape of the highlight curve. While precise tonal placement is possible in midtones, with highlights you're substantially stuck with what the print hands you once you've established the overall exposure and contrast. The curves tools in digital printing make it possible to shape highlight tonal rendition with exquisite precision, independent of any other control you exercise over the print. Most notably, it's possible to get a linear rendition of tones and colors that preserves both delicacy and separation much better than in a darkroom print. A photograph like figure 2 is a good example of one that turned out much better as a digital print than a dye transfer. Not that the dye transfers don't look fine, but the digital print looks even better. Getting exactly the right tonality and tonal separation in those clouds so that it properly mirrors the forms in the hills, which is what makes this photograph work, succeeds better in the digital print than in the dye transfer. Extreme highlights exist in places you wouldn't think, for example in figure 3. Colors that are close to primaries, like the greens and yellows in this photograph, actually depend on the quality of the highlight control. The reason for that is that colors that are very close to primaries contain only small amounts of the complementary color. For example, where the greens are most intense and delicate in this photograph, there is almost no magenta density; the precise quality of the greens is entirely dependent upon the highlight rendition of the magentas. Figures 4 through 6 show the red, green, and blue channels for this photograph; they would correspond to cyan, magenta, and yellow ink or dye densities in a print. Notice how high key much of the green image is, especially in the yellow-green grass at the base of the hills. Getting these colors and tones exactly right requires being able to control the highlight curve shape for the magenta image very precisely, and that's extremely difficult in the darkroom. By itself the dye transfer print looks wonderful, but placed side-by-side with a digital print the colors in the dye transfer print look cruder and less real. Some of you may be wondering, apropos the discussions of a few weeks ago, how this relates to the art market. It doesn't. The art market is not remotely driven by measures of visual quality, either objective or subjective, nor by the artist's intent. The concerns of this column have nothing to do with making prints that sell better or for more money. Does it bother me that people would rather buy a much more expensive print of mine? You get two guesses, and the first one doesn't count. There's art, and then there's commerce. Original contents copyright 2013 by Michael C. Johnston and/or the bylined author. All Rights Reserved. Links in this post may be to our affiliates; sales through affiliate links may benefit this site. -et- (signed Tom): "As an addendum to Ctein's comments above, a couple of years ago I wrote to him asking about purchasing a dye transfer print of 'Apollo 17 at Dawn.' However, I was interested in a larger print than the size he listed in his catalog—which offered only the smaller of the two sizes for which his other dye transfer prints were available. "Ctein replied that this image would not meet his standards for quality if printed any larger, due to limitations imposed by the negative sharpness. He wrote that he had a second negative shot at the same time that was quite sharp, but simply could not produce a quality dye transfer, so his only option was to limit the size of his dye transfer print from the first negative. "Ctein replied that the discussion had made him take another look at his negatives, and that he thought that he might be able to use the second negative to generate a print that met his standards if he used digital techniques. Accordingly, he was going to experiment to see if his 40-year-old negative that could not be used for a dye transfer print would work well for a digital print. "The resulting print is now framed and hanging on the wall in my home. It is everything that I would have expected from looking at his dye transfer print in his online catalog, and much more." Nigel: "That was one of your most interesting columns—which is high praise indeed. Though it makes me wish even more that you'd offered the SR71 pictures in the recent sale (probably a minority view)." Mike replies: I have to take the blame for that, as I chose the pictures. The SR71 shot was in the running, however. I'd still like to see it as a dye. "Then I remembered an encounter I had with an acquaintance some years back (when digital was fairly new). This fellow knew that I made cyanotypes (I still do) and he wanted to show me his cyanotypes. "You can probably see where this is going...he had some bluish-toned inkjet prints (on glossy paper, no less) for me to look at. I tried to be polite and explain that they were not at all similar to my cyanotypes except for the hue. "I have had similar discussions many times since but it is a losing battle. I fear that the differences in media are lost on many photographers...present company excepted! "And don't get me started on simulated IR images...these should be against the law! "Thanks for the interesting article. It is too bad that this is the end of the line for dye transfer." Figures 4, 5, and 6 are why it's important to look at a three channel histogram while shooting, not a combined monochrome histogram. ...and there is commercial art. Please count me in as one who would be very interested in a digital version of Niagara, for my youngest daughter, studying art history now at Wellesley---a lover of Innes and also admirer of Church, both of whose Niagaras are wonderful. Yours measures up! Do you tihnk the problem in the shadows is due to the dot size or just software - or something I missed. Why do your separations yield a nice dark black while printer inks yield a muddy green requiring a black ink? Have you seen Bill Atkinson's book "Within the Stone"? He wrote half the code in the original Macintosh, as well as MacDraw and Hypercard, then retired and became a full-time photographer. For the book, he worked with the Japanese printers to get the maximum gamut out of their paper, press and ink set, writing his own color-calibration software along the way. Hard to tell looking at a screen. Personally I think a dye transfer looks great but so can an inkjet print. Beauty is in the eye of the beholder I guess. To me the intent of the image should be clear, if your intent needs great detail in the shades so be it. Then dye transfer can't be beat (for now since the gamut in the darks of a inkjet is limited (remember the dark band in the shuttle picture)). But it sure would be a pity if some great pictures vanish from view because the medium to print them is now obsolete. "At the highlight end of the tonal scale, though, digital printing is massively superior to anything I can do in the darkroom..."
Possibly the clearest explanation I have read of exactly when digital printing is superior to the darkroom! Do you think digital printing is limited by the fact that the ink sits "on" the surface of the paper more whereas with emulsions the dyes are "inside" and so the kind of reflectance is different? My impression of blacks on silver gelatin is that they are deeper than blacks on digital prints (glossy) and so what you are saying about dye transfer shadows- the depth, do you think the nature of the depth of the print is an issue? in the future perhaps paper manufacturers could work to get the ink further under the surface- like those awful colourlife squeaky inkjet prints we had for a while, do you think that would help? Where else on the web, regarding photography, should I read so rich and deep texts, otherwise than chez TOP? At the risk of being a snotty know-it-all...you will recall that when the print sale went up, I specifically pointed out that 'Roses Against Black Stone Wall' would lend itself particularly well to Ctein's skills and printing process! Why do photographers who do their own printing prefer inkjet to laserjet for color prints? In terms of (archival) longevity, would laserjet rate better than inkjet? At the risk of being Philistine (or worse), would laserjet color printing approach dye transfer benchmarks more closely than inkjet when printing pictures the likes of your Jewels of Kilauea series and Fig. 2? The reason I'm asking is that inkjet printers don't agree with me. I've gone through several models in as many years or less and stopped buying when #5 conked out. And that's only for printing documents and graphs (charts). I plan to outsource printing my pictures. *A B&H search yielded only 6 "personal" laserjet printer models (600 x 600 dpi) ranging in price from USD 399 to 740, two of which are "back-ordered." There are 6 "enterprise" models (1200 x 1200 dpi) ranging in price from USD 670 to 2,700, none of which are in stock. A toner cartridge (good for 2,600 "standard" pages) for current models of personal printers costs USD 99 & up (of which you have to buy three). Tri-packs for enterprise models begin at USD 198 (2,000 pp). All printers ("All-in-one") and toners (CMYK) are HP. Locally (downtown Manila), a commercial printer who has two humongous Koritso laser printers accept color prints up to 20 X 36 in. (≡USD 20! apiece). I haven't tried them yet, but I've seen their 3R prints of customers' snapshots (in Kodak "silk" paper) which I'm liking (red-eyes and all). To get the same thing out of a digital printer, what you need is a paper/ink/dye combination capable of achieving that density range, that's all. It's not a software or dot size issue. There's nothing that says that's inherently impossible. In fact, back at the end of the last millennium (I still get a kick out of saying that) I hacked an inkjet printer to run real honest-to-goodness dye transfer paper and dye transfer dyes. It was just for the fun of it; the results looked lousy. Very non-optimized hardware and software. If someone had wanted to throw $100,000 or so at me, I could've made a digital printer that would've had precisely the same density range and color gamut of the dye transfer print… because it would have used dye transfer materials! Well, of course you can't tell much looking at the screen. For one thing, I didn't give you comparison photos of dye transfer vs. digital prints. For another, even if I had, it wouldn't mean much because the color gamut and density range of the JPEG illustrations in this article are vastly inferior to what a dye transfer print can render. I wrote about Bill's book back in 2007. And, as of last Xmas, he still had some copies left (I bought several as holiday gifts for friends). Fresh Pahoehoe may, in fact, make a satisfactory digital print. I have a file in process on that, but it's not near complete. 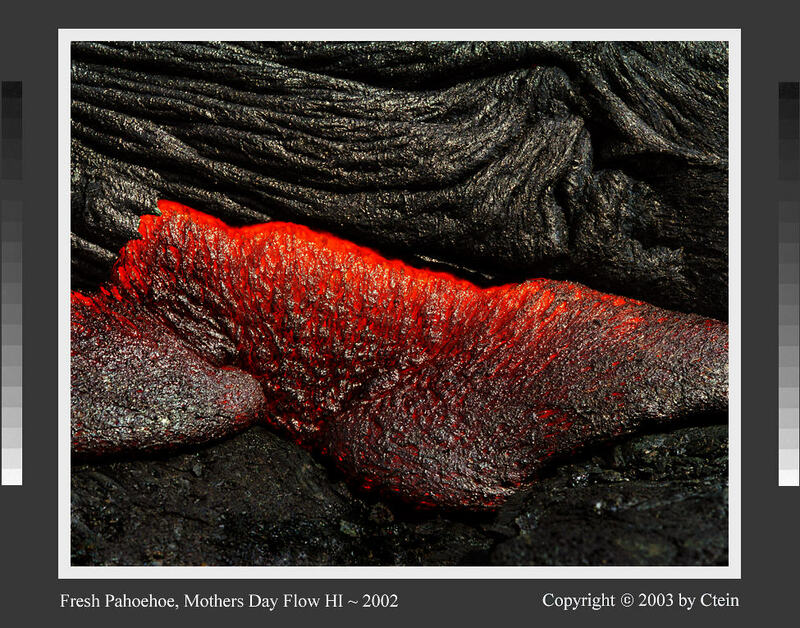 The reason it may work is that most of what makes that composition is the contrast between the glowing reds, the specular white sunlit highlights, and the shiny black pahoehoe. That aesthetic impact may very well carry through in a print with lesser density range. Well, basically, no. Tricks with the lighting can reveal shadow detail better, as you point out, but it won't do anything to expand the total density range. It's kind of like hitting the “loudness” button on a cheap sound system. It amps up the base And the treble, but it doesn't give you a wider frequency response or more decibels of range. Another good, uniquely informative article, Ctein. Thank you. I recently re-watched the dye transfer process video you did for Michael Reichman in 2004(?). I highly recommend that anyone interested in this vanishing process beg, borrow or steal a copy of the Luminous Landscape Video Journal Vol 3 Issue 11. There are two loosely-related points you made that I'd debate or at least expand. "For many photographs, even most, this is not a critical issue; the quality of the shadow detail doesn't make or break the photograph. Sometimes, it does." Your point is valid but the second sentence is actually the weightiest. In more than a handful of cases I would assert that shadow detail is what distinguishes a "real", or vintage, print from a secondary print or book reproduction. Any schmoe can print highlights and mid-tones. It's often when you view a master print, often vintage, that you realize that you had not really seen the work until that moment. The gist is in the highlights and mid-tones but the magic and emotional texture of an image is often deep in those shadows. In my experience this applies to many celebrated early-to-mid-century photographers. "The art market is not remotely driven by measures of visual quality, either objective or subjective, nor by the artist's intent." Again, while there are many examples that would buttress your assertion I think it might be a bit too assumptively dismissive. Curators, top-end dealers, collectors, and auction houses do seem to obsess more over provenance than -apparent- technical-visual qualities. But, again, my own observations have revealed that the "vintage" print made by, or under the auspices of, the photographer often features more detail (yes, often especially in shadows) than later prints. Later prints may very well "look" snappier, with more sharpness and contrast. But they often lack the overall warmth (literally) and consistency of emotional message that a photographer's original prints conveyed. Hence, older and often less jazzy prints are worth far, far more for a reason. I can get a nice print even from Costco, but it takes daylight to see the true values on the paper. Indoor light is wretched. We know where this will end up - a back-lit OLED panel on the wall, so that your display finally looks like your editing monitor. Just for fun, design a 600ppi Adobe RGB calibrated display of size X and price it. It may take a few years, but then what? I am retired and spending most of my effort doing/learning photography, but I am so happy that I don't have to sell it... I have never seen so much good work. Luckily I'm just entertaining myself. I've never seen a laser printer ("laserjet" is a brand name, not a type of printer) that produced prints that looked anywhere as good as the better inkjet printers. So, the effective answer to all your questions is some flavor of "no." So where does this historical last sale fit? Ctein, are these prints the last of their kind, the last of their kind from a printer of renown or somewhere in between? Interestingly of the Ctein prints I own, all of them have the same color theme: bright colors on black (wild ginger, competing ferns, and soon, roses). "It is too bad that this is the end of the line for dye transfer." It may become increasingly difficult to find those who master the art, but the end of the line? Andy Cross in Australia, Jim Browning in Vermont and Egbert and Bettina in Germany still make dye transfers commercially. Guy Stricherz on Vashon Island may also, but no one's heard from him in a while. There's a handful of others doing it for themselves. When I stockpiled supplies twenty years ago, I thought there'd be a very good chance I'd be the last dye transfer printer standing. None of us doing it expected anyone to be doing it two decades later. Happily that's turned out not to be the case. A few people have even manufactured their own materials. I think dye transfer's likely to continue as an obscure and highly-bespoke craft indefinitely, the same way you can find a handful of people around the world still doing things like daguerrotypes.